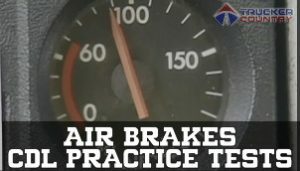 Free Online Air Brakes CDL Practice Test questions and answers to help you pass your state’s Air Brakes DMV exam. There are 3 testing modes to help you prepare. To drive a truck or bus with air brakes, you need to know the information in the CDL Air Brakes section of the CDL manual. To pull a trailer with air brakes, you also need to know the information in the Combination Vehicles section. Air brakes use compressed air to make the brakes work. Air brakes are a good and safe way of stopping large and heavy vehicles, but the brakes must be well maintained and used properly. Air Brake System Parts, Dual Air Brake Systems, Inspecting Air Brakes and Using Air Brakes. Download your state CDL manual and open up it up in another tab of your browser. Read it over, but you don’t need to try to memorize it! On this page, begin the first of our CDL practice tests in Classic Mode. See how well you do, but try not to stress out about any mistakes at this point. Next, switch to Practice Mode for intense preparation, complete with instant correct answers after every question and a CDL reference. When you think you’re ready, take the exam! Each Exam Mode practice test is timed and you get your grade and results only after you’ve finished each test. This is very similar to the official state CDL written exams! Note: For more information, see our guide on How to Pass the Official State CDL Exams.